Slidebean is a tool that makes it easier for presenters to create professional-looking slides by taking care of the design element. The software is a collection of design templates, selection of premium fonts and high-end color palettes that help define the overall design of presentations. The easy-to-use interface requires presentations to just enter the content and takes care of the rest. 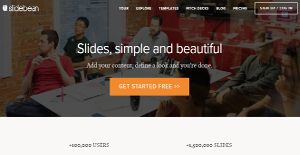 This allows users with even zero design skills to create impressive slides and is particularly suitable for small-medium businesses that don’t have designers required to create rich presentations. Slidebean is a good alternative to PowerPoint and Keynote and offers many features required to effortlessly create professional presentations. The software includes everything presenters need to get the job done, including professional icons, photos, charts and more. Ease-of-use and availability of professional, ready-made templates makes Slidebean a good alternative to other traditional presentation software. It takes care of the design element and offers seamless online collaboration. The presentations are kept in sync without user intervention and can be shared with anyone using device of their choice, including smartphones, tablets and PCs. It saves time and effort required in creating presentations from scratch by providing dozens of ready-made templates created by professionals. The purpose-built templates ensure that the presentation is relevant and matches requirements of businesses. A smartphone can be used as a remote control to control presentation flow without any additional software. This makes it easier to manage presentations without any hassle. All a presenter needs to get the job done is to select from pre-filled decks, which also serve as Content Templates, while the content placeholders can also be replaced easily. The software features all the elements needed to easily create professional slides, including title, text, bullets, quotes, images, fill, icons, videos, charts, tables and more. If you are interested in Slidebean it might also be sensible to examine other subcategories of Best Content Management Software gathered in our database of SaaS software reviews. There are trendy and widely used solutions in each software group. But are they necessarily the best fit for your enterprise’s unique needs? A popular software product may have thousands of customers, but does it provide what you require? For this reason, do not blindly shell out for popular systems. Read at least a few Slidebean reviews and consider the elements that you desire in the software such as the fees, main tools, available integrations etc. Then, shortlist a few apps that fit your requirements. Check out the free trials of these apps, read online opinions, get clarifications from the vendor, and do your homework thoroughly. This profound groundwork is certain to help you select the best software solution for your organization’s specific wants. How Much Does Slidebean Cost? We realize that when you make a decision to buy Content Management Software it’s important not only to see how experts evaluate it in their reviews, but also to find out if the real people and companies that buy it are actually satisfied with the product. That’s why we’ve created our behavior-based Customer Satisfaction Algorithm™ that gathers customer reviews, comments and Slidebean reviews across a wide range of social media sites. The data is then presented in an easy to digest form showing how many people had positive and negative experience with Slidebean. With that information at hand you should be equipped to make an informed buying decision that you won’t regret. What are Slidebean pricing details? What integrations are available for Slidebean? None, i'm just stuck because i started here. I havent had the time to rebuild the deck elsewhere. If you need more information about Slidebean or you simply have a question let us know what you need and we’ll forward your request directly to the vendor.